Although most of the games that I play are role-playing games of one kind or another (hence, you know, the name of this blog), I have probably spent more cumulative time in my life playing Dance Dance Revolution. My daily workout routine involves 30 minutes of continuous DDR played though In The Groove‘s excellent Fitness Mode. However, DDR is quite the investment. High-quality pads are pricey, and since you’re stomping on them every day, those pads don’t last forever. Therefore, it behooves all serious DDR players to figure out ways to maximize the lives of their pads and improve their playing experience in the least expensive ways possible. As a fifteen-year DDR veteran, I have quite a few insights to share on this matter, so allow me to do so in the following post. 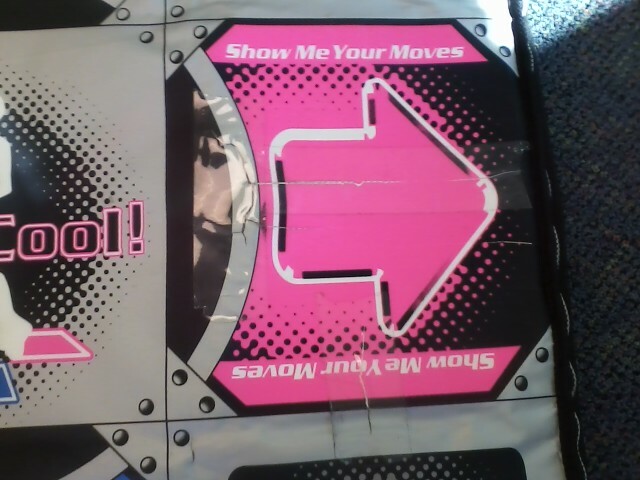 This is a huge issue for home DDR aficionados. Unless you shelled out enough money for a heavy metal pad, the grippy surface on the bottom of soft pads typically only grips effectively on a hard floor. Solution: make a hard floor by getting a hold of a plastic chair mat. Staples and Office Max consistently stock these items, though I picked mine up at Costco for $19.99. If you can find one at a garage sale or a thrift store, even better! 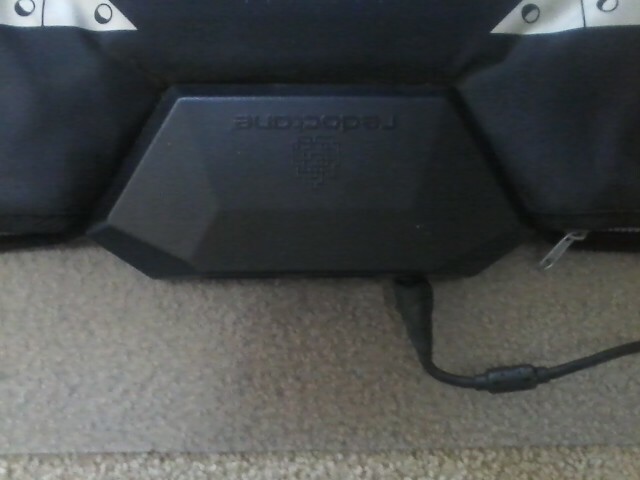 I see frayed wires a lot on DDR pads that have seen some use. Often, the pads still function fine despite the damage, but touching the bare wires can give you quite a nasty shock. Electrical tape is certainly adequate to cover exposed wiring, but tends to peel off and start gathering lint. 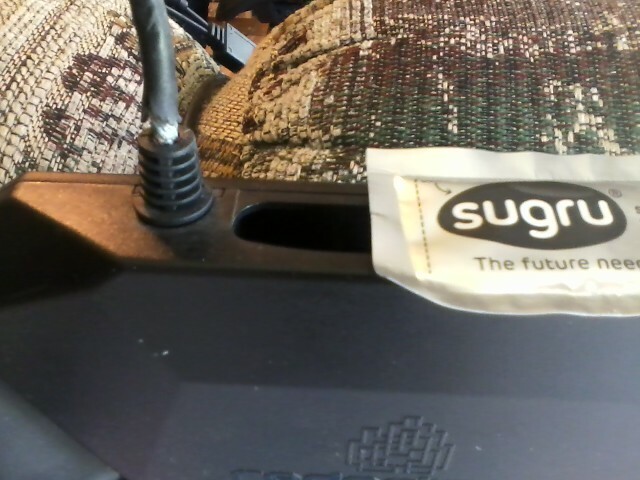 Solution: pick up some Sugru. Sugru is a pigmented, moldable glue putty that you can sculpt and shape like Play-Doh, but dries to a solid, flexible, permanent plastic in 24 hours. It’s pretty neat stuff. I bought a three-pack of single-use packets for about $10 on eBay. When dry, the fix is almost invisible, and it’s flexible enough to take the abuse that a game controller cord will inevitably take. Here’s another problem that you often see in older DDR pads, especially ones that have been improperly stored. Repeated folding of the plastic-y surface of a dance pad can cause cracks in the outer surface, which will severely decrease the pad’s lifespan if not repaired. Many online discussions of this issue suggest using packing tape for repairs, which totally works, but I find that after a few weeks of dancing on a pad that has been repaired with packing tape, the tape’s edges start to peel up and collect lint. This not only looks kind of gross, it also decreases the effectiveness of the fix. 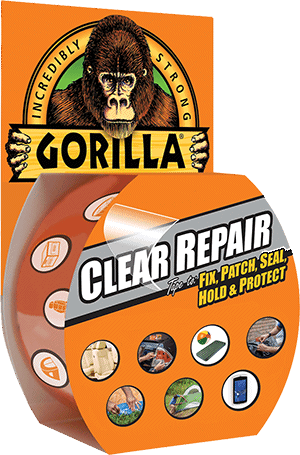 Solution: Gorilla Clear Repair tape. This stuff is essentially packing tape on steroids. I picked up a roll at WalMart for about $7. Tear it off, stick it over the tears, and rub the edges down vigorously, and you’ve got yourself a permanent, durable fix. It works well on internal tears, also. 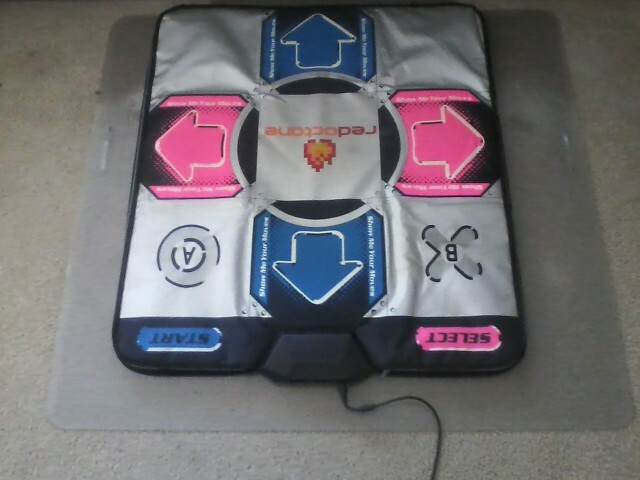 Since DDR is my favorite form of cardio, I like maximizing the amount of calories I burn in each 30-minute DDR session. I’ve mentioned before that Red Octane’s In the Groove has what I consider the best fitness mode of any release of DDR, mostly because it allows you to set your own time limit for a continuous stream of songs at a chosen difficulty. This means that your heart rate stays elevated throughout the entire exercise session, because you don’t have to pause between each song or course to select another. Nor do you need to worry about the difficulty curve, because each song is set at exactly the difficulty with which you are most comfortable. However, as excellent a workout as DDR certainly is, it only works out your legs, leaving your arms to flop about uselessly. 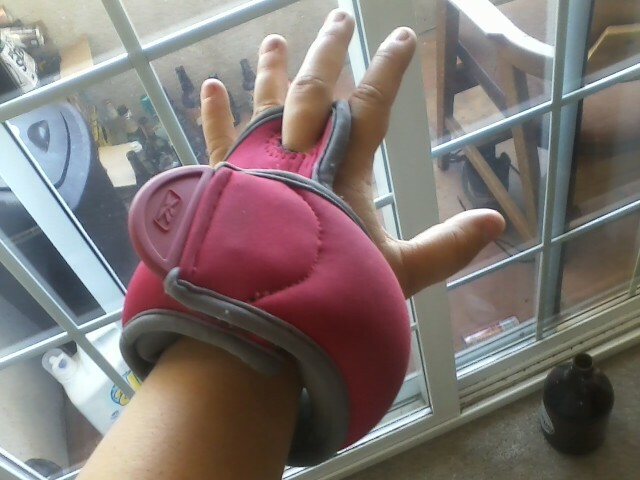 I am aware that I am not quite wearing these correctly, but I believe that they were designed for a man, and are therefore much too large for my small hands. Solution: arm weights! I found a pair of 1-pound weights at a garage sale for $1, and I see them all the time at thrift stores, but it looks as if you can purchase them new for about $20 at Amazon.com. Just the act of wearing them probably ups my calorie burn slightly, but to make things more interesting, I also lift my arms on Freeze arrows during my workout. If the Freeze occurs on a Left or Down arrow, I lift my left arm; on a Down or Right arrow, I lift my right. Not only does this serve as strength training for my arms, it also makes me feel like I am actually dancing, since most forms of dance do involve both your arms and your legs. So there you have it. Four simple, relatively inexpensive hacks to up your DDR game. Happy DDRing!